Calluna vulgaris 'Velvet Fascination' looks like a fluffy bowl of meringue when in bloom, with airy white flowers covering greyish-silver stems. Cluster it near plants that have burgundy foliage like 'Grace' smoke bush (Cotinus x 'Grace') or 'Purple Diamond' fringe flower (Loropetalum chinense 'Purple Diamond'). They're also fun used in the foreground near 'Silver Spear' Astelia (Astelia chathamica 'Silver Spear'), a spiky evergreen grass with wide leaf blades and a silvery sheen. 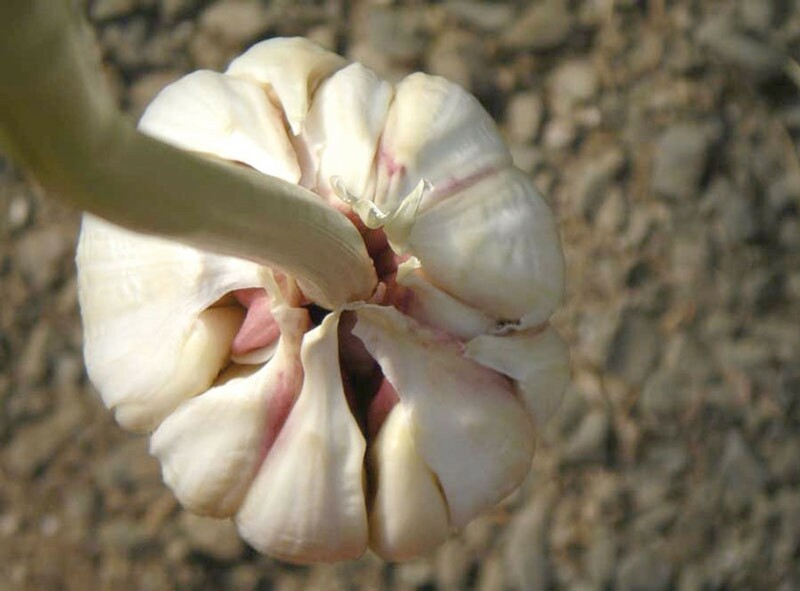 From Ancient Egypt to Humboldt County, garlic is one of those plants that you can find in almost every garden. 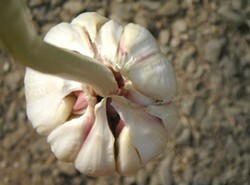 It is one of the oldest cultivated crops, and all around the world people still rank garlic among their favorite foods. And it's not just food —it's medicine, too. Garlic is used as an antibiotic, antiviral, heavy metal detox, and to fight colds, high blood pressure, Alzheimers, diabetes and cancer. It even wards off vampires and evil spirits, or so they say. We are fortunate in Northern California to have the perfect climate for garlic. Our seasonal rains followed by dry summers make for an easy crop and you shouldn't have much trouble, but here are a few tips to seal the deal. You can plant that nice organic garlic you got at the Co-op or the farmers market. It was delicious, right? And it will probably grow just fine. But keep in mind that plants that were grown specifically for the purpose of being seed stock have been monitored for traits such as disease resistance, drought tolerance and uniformity, among many other things. And, by purchasing seed stock from a reputable grower, you are connecting to a lineage that is building long-term food security. If you want to start out with some locally bred seed stock, I recommend a handful of sources below. As for varieties, you will never run out of options. Most types of garlic will do great just about anywhere in Humboldt, but this year I'm going to try the following. Garlic likes full sun, but it will still do OK in a spot that gets some shade. Garlic and roses are classic garden companions, and it stands to reason that garlic will also do well among other members of the rose family. Try planting patches of garlic around your plums, peaches, apples, raspberries, blackberries and cherries. Or just clear a sunny area in your garden that you don't mind devoting to garlic until next June (or so). Here's a cool tip: Use a Cholula bottle to lay out the holes in your freshly weeded and raked garden bed. Make each hole 6 inches apart, in a pattern that makes the best use of the space in your bed. Garlic is drought-resistant, to a point. A thick mulch can make a huge difference in whether your plants die of thirst or not. When you've just planted the cloves and filled the holes with compost, spread a thin layer of manure over the beds. Top that with 2 inches of straw mulch and saturate the whole area with water. Add another inch of straw and forget about it for the winter. If we have a very dry Autumn, water the patch a couple of times. But it will probably be just fine on its own as long as we get some rain by January. In the early spring, the stringy green tops will be pushing out of the straw mulch, as will a bunch of random weeds. Go through and pull out the weeds, pulling off the straw mulch as you go. Now use a small rake to scratch in some organic fertilizer. Remember that whatever works for roses works for garlic, such as oyster shell and fish meal. Or ask fellow gardeners what they recommend. After fertilizing, pull the mulch back over the weeded garlic patch. Top with one more layer of fresh straw to fill in the gaps. Water well. Now you don't need to do much else until it's time to harvest. If you planted stiffneck varieties, you're in for a treat. The flower stalks, affectionately known as "scapes," are delicious when pan-fried or flame-grilled. The stalks will shoot straight up, crowed by a point head-bud, which will plump out and then curl around the stalk in a spiral pattern. Once the circle is complete, the scapes are ready to be eaten. It's time to harvest when all of the tops are at least 60 percent brown. The night before, give the whole patch a good watering to soften up the ground for digging. Harvest gently, with a D-handled digging fork, working slowly and attentively to avoid slicing into the heads. Don't yank on the tops and don't cut them off. Garlic is delicate when first harvested! And don't dig up the whole patch at once. Dig up a few heads and see if they are mature. Have the bulbs rounded out, or are they still elongated? After harvesting, leave the tops on and either braid them together or gather them into bunches for curing. Hang in a cool, dark, dry space for at least a month. This will cause the bulbs to harden and tighten. Now you can hang up the braids in the kitchen, and/or cut off the tops and store the heads, sell them, eat them, pickle them or give them to the neighborhood kids for Halloween! For an adorable and easy to follow video about braiding garlic, and more on the health benefits of the plant, visit www.northcoastjournal.com. Heather Jo Flores is a writer, farmer and interdisciplinary artist from Oregon. Visit www.heatherjoflores.com and www.foodnotlawns.com.